The suffragists who have been arrested for picketing the White House with banners demanding woman suffrage as a political right, deserve our heartiest congratulations. Their straightforward and courageous propaganda comes as a happy reassurance that the soul of the suffrage movement has not been corrupted by opportunism. Harris & Ewing Photography, Washington, D.C., August, 1917. It was perhaps to have been expected that many women would succumb to the temptation of bargaining with militarism for the vote. 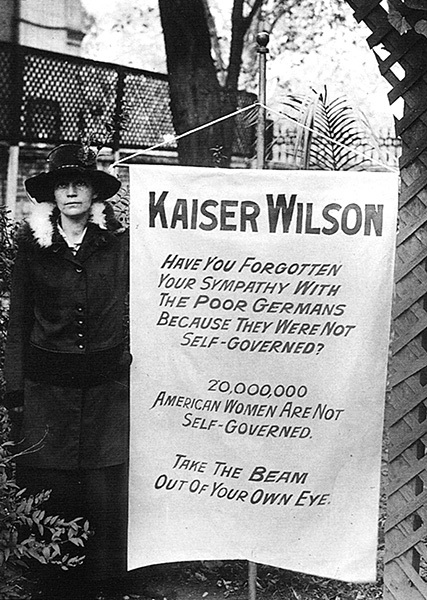 Yet the spectacle of women anxious to assist a military bureaucracy in depriving others of their liberties, as signified by their offer to help in the work of conscription registration, in order to gain a political privilege, has been viewed with intense chagrin by those who regard the political emancipation of women as part and parcel of human emancipation. It would be useless to point out to such bargainers that they will fail to receive their hoped-for reward at the hands of the militarists; they will have to find that out by pathetic experience; they will learn well enough who are their friends. But meanwhile this proof that politically sound and humanly decent tactics have not been discarded by the best elements of the movement, is welcome if expected news. The incident which resulted in the arrest of the militants was sufficiently ironic. It is not to be wondered at that the police failed to recognize the “seditious and treasonable” inscription on their banner as the President’s own words. 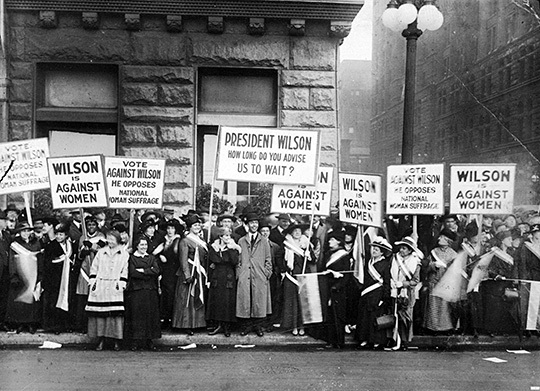 Demand an Amendment.” Washingon, D.C., 1917. But that fact, when discovered, only made their offence more serious. To turn the President’s words against him, is to commit, apparently, a species of lese–majeste. International Amphitheater in Chicago, October 20, 1916. It is all right to talk about liberty and self-government when you mean something to be instituted abroad by means of conscription and censorship at home; but if you want to make those beautiful phrases mean something at home, you are on the danger line—where all lovers of liberty belong, and we are glad to see the militant suffragists taking a conspicuous place.